Had a great weekend over Memorial Day. 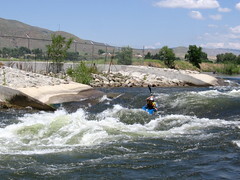 We had Colin Kemp from Team Jackson show up and paddle the Payette with us. Colin, aside from just being a great guy to be around, is an excellent instructor and really had the boys and I improving with great pointers. The ‘Main’ was at a great level, Climax was in pretty well, and the Gutter was not bad. 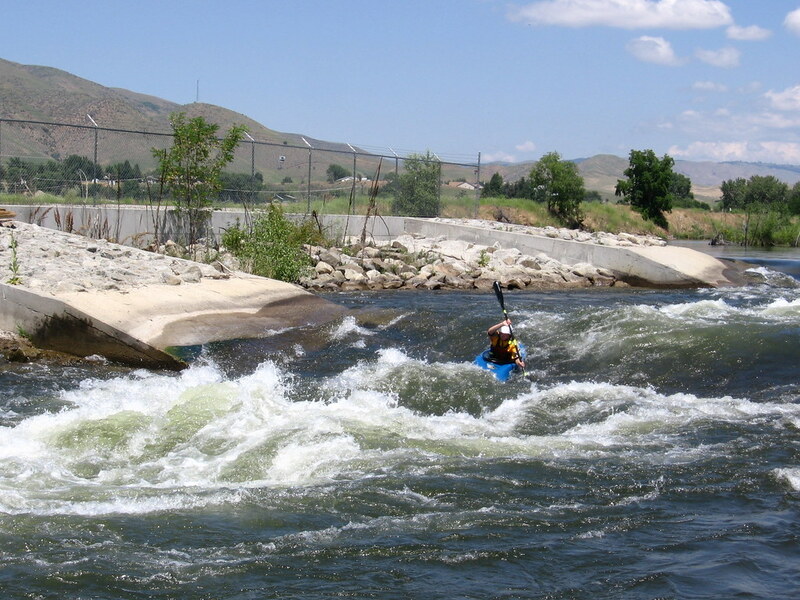 If you ever have the privilege of paddling with Colin and his wife – expect to progress and have a great time! Looks like it’s going to get hot this week – oh, yea! Memorial Day Weekend Looks Like Good Paddling! Temps 80 – 85 Friday through Monday and water above 4K on the Main Climax is looking pretty good – if the main wave isn’t doing it for you try catching one or two back in the wavetrain. The water is too low for the Bladder Wave, but the Gutter is at a good level. Be safe and have a great (and long) weekend! Recreation reports continue to change and are being updated for the Memorial Day weekend. If you’re a whitewater boater interested in going up north to the Lochsa and Selway rivers, here is some news from the U.S. Forest Service. All campgrounds along the Selway River corridor will be open for the Memorial Day weekend. O’Hara Campground, 7 miles east of Lowell along Selway River Road, is now open. Reservations can be made for O’Hara Campground, the Johnson Bar group site, and the Meadow Creek Cabin. O’Hara Campground is suitable for RVs. Boyd and Selway Falls campgrounds are also open and ready for visitors. If you’re interested in camping along the Lochsa River-U.S. 12 corridor, check out Powell, Wendover, Whitehouse and Wilderness Gateway campgrounds. Most high elevation are still blocked by snow up north. If you’re thinking of driving the famed Magruder Road, across the middle of Idaho from Elk City to Darby, Mont., forget it. The road is open for a few miles beginning at the Red River Ranger Station but closed after that. The road from Dixie to Mackay Bar is still closed. Nature took care of the logjam at Pistol Creek on the Middle Fork of the Salmon River over the weekend. High water took it out and early spring river runners are pretty happy about it. Hazards do remain. The strainer above Pistol Creek at Lake Creek is still giving boaters heartburn. Some snags in the river downstream are serious considerations, too. The logjam at Pistol Creek appeared at the same place as last summer. The U.S. Forest Service blasted last summer’s logjam because several hundred rafters were stranded. The snow, what little we had, has burned off early. It’s a lot different than it was in the normal snow years when many high-country recreation areas were inaccessible at this time of year. I remember Memorial Day weekends when the Warren Wagon Road over Secesh Summit, north of McCall, had to be plowed to open access to the backcountry town of Warren. The snow-recording site for Secesh Summit at 6,520 feet is registering no snow this week. There were Memorial Day weekends when snow remained in Upper Payette Lake Campground, north of McCall, and it was doubtful the campground would be open in time for the holiday. We’re going to put out our annual recreation outlook for the holiday weekend in Thursday’s Idaho Outdoors Magazine. We’ll have information on trails, campgrounds, rivers and reservoirs in this drought year. It’s going to be a surprise. There were years when the campgrounds around Lost Valley Reservoir near New Meadows were still soggy on the first weekend of the summer season. Not this year. There were times after good snow winters that hatchery personnel with the Idaho Department of Fish and Game didn’t know if they would get into Sagehen Reservoir, northwest of Smiths Ferry, with a big tanker truck to stock it with trout for Memorial Day. Snowbanks were on the boat ramp where they needed to back down to the water. There were years where cross-country skiers would make tele turns on Snowbank Mountain near Cascade in late May. It doesn’t look like there’s enough snow for that this year. It’s a strange year in the mountains, and it’s more surprising than you think. I remember some years pulling into a campground for the Memorial Day weekend and having to camp next to a snowdrift. Not this year. I was browsing online at the Natural Resources Conservation Service’s SNOTEL sites around Idaho and some still have snow, but it’s sporadic. Deadwood Summit at 6,860 feet has 28 inches of snow. That area did get a pretty good dumping of snow. The Trinity Mountain site at 7,770 feet has 28 inches. To the east near Sun Valley, the Dollarhide Summit site at 8,420 feet recorded 16 inches of snow. But Galena Summit at 8,780 feet has only a trace of snow in certain areas, according to its SNOTEL site. I’m surprised the SNOTEL site at Banner Summit, the summit between Lowman and Stanley along Idaho 21, is registering no snow. It’s at 7,040 feet. The Smiley mountain site in the Pioneer Mountains at 9,520 feet only records 9 inches of snow. Here’s another interesting tidbit. The Idaho Water Supply Outlook Report released by the Natural Resources Conservation Service earlier this month showed that 30 automated snow-measuring stations in Idaho were melted out by May 1. That means there was no snow at those mountain locations. Normally, only three sites are melted out by that date. The unseasonably warm and dry weather from April on burned the snow off early. Water experts took a helicopter flight over the Boise and Payette river basins May 1 to do a snowline survey. The snowline was at 7,600 feet in elevation. Normally it would be around 6,000 feet on that date. That puts us one month ahead on the snowmelt. That also puts us one month ahead in the recreation season. Imagine backpacking in places in June where you normally couldn’t get into until July. I was canoeing on the Middle Fork of the Boise River last weekend. The flow was around 3,000 cubic feet per second. It was ideal. In a normal year, the river might be swollen with runoff and too dangerous to run. If you talk to some anglers in the McCall area, they are thinking the ice will come off some alpine lakes in time for Memorial Day weekend. That is unusual in normal or colder years. Some of the lower mountain lakes, including Boulder Lake around McCall, could be accessible for fishing. You never know with the warm weather we’ve had. It’s a strange year in the mountains.